This physical theatre piece is loosely based on Coleridge’s The Rime of the Ancient Mariner. Continuing the long tradition of physical theatre at Studio 58 (joining works like Nocturne, Scenes from a Courtroom, and The Company), Kosmic Mambo is an adaptation of The Rime of the Ancient Mariner by Samuel Taylor Coleridge, set during the space race of the 50s and 60s. Instead of a ship on the ocean, this story takes place on a spaceship. Telling the story entirely through movement, gesture, facial expression, and body language, this was a unique production performed by a talented cast. Taking a 19th century seafaring story and transforming it into a 20th century space age science fiction story may sound like it would lead to a strange outcome, but the end result is a moving story with many parallels to Coleridge’s poem. Instead of an albatross, the burden worn around the cosmonaut’s neck is the collar of a dog he killed, and instead of a lack of water to drink, these voyagers suffer from a lack of air to breathe. The line of cosmonauts, in their bright orange space suits, that marched onto the stage in the opening scene was mesmerizing. Using diverse facial expressions and clear, deliberate movements, they told a complex story while creating a dynamic fictional world on stage. Inside their spaceship, they floated around as if there was no gravity, and distinct characters emerged based on their interactions. 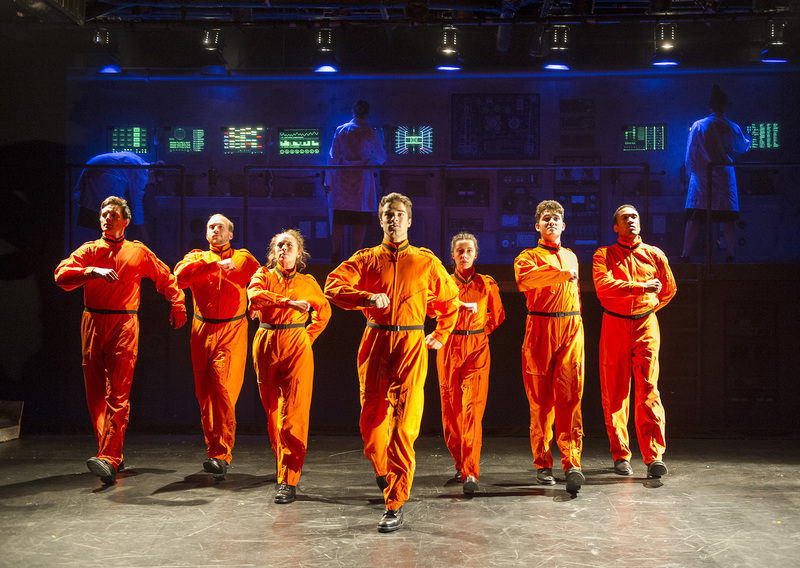 Created by David Mackay, who was last at Studio 58 for The Government Inspector, the play tells the fictitious story of a failed attempt by the USSR to send six cosmonauts to Mars after the US successfully landed on the moon. Using music from 1968 to 1972, the play creates a luminescent, otherworldly atmosphere. Using only gesture to tell a story is a unique art, and Wendy Gorling, who is a master in this field, joined David Mackay to direct the piece. Just as The Rime of the Ancient Mariner is a story told by one of the ship’s survivor’s, this tale is told from the perspective of one of the cosmonauts from the failed mission in present day. He meets a girl outside a bar, and it appears she is a wedding guest who has just left a reception. He begins his story with “There was a ship,” just as it begins in Coleridge’s poem. We see the two of them a few times as he continues to tell his story, and the girl gazes on from the side of the stage as if watching the action. While I like that there was a frame to the story, and that it was in keeping with Coleridge, I found the presence of the girl watching from the side of the stage the entire time a bit distracting. The only other thing that bothered me were a few lulls in the action that probably could have used some dialogue. Despite this, I enjoyed my first physical theatre experience, and I’m glad Studio 58 continues this important tradition. Kosmic Mambo runs from October 2 to 19 at Studio 58. $10 student rush seats are available for all shows. For more information, visit studio58.ca.